Enterprises rely on the web not only to innovate and compete, but also to conduct business. But the web poses significant security risks that are easily encountered by users, yet not so easy to detect. Some of the most sophisticated web-based threats are design to hide in plain sight on legitimate and well-trafficked websites. 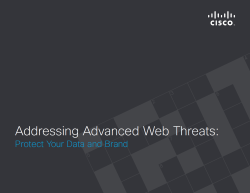 Once an organization’s network is compromised, it can take weeks, months, or longer for an advanced persistent threat enabled through web malware to be detected in the network.